ISEE-3 was launched in 1978 to study the constant flow of solar wind streaming toward Earth and NASA has signed an agreement with citizen scientists attempting to communicate with the old spacecraft. 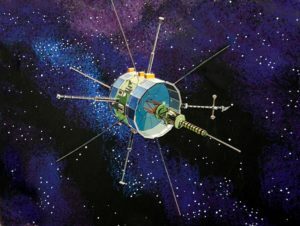 The ISEE-3 Spacecraft is returning toward Earth 35 years after it was launched and 33 years after its official mission end. Two instruments on the satellite are attributed to the late Dr. Kinsey Anderson. The first instrument studied, Interplanetary and Solar Electrons 2 keV to > 1 MeV and the second instrument studied X-Ray and Gamma Ray Bursts in the 5-228 KeV range. Both Instruments were also worked on by Peter Harvey, Henry Heetderks and the late Henry Primbsch.